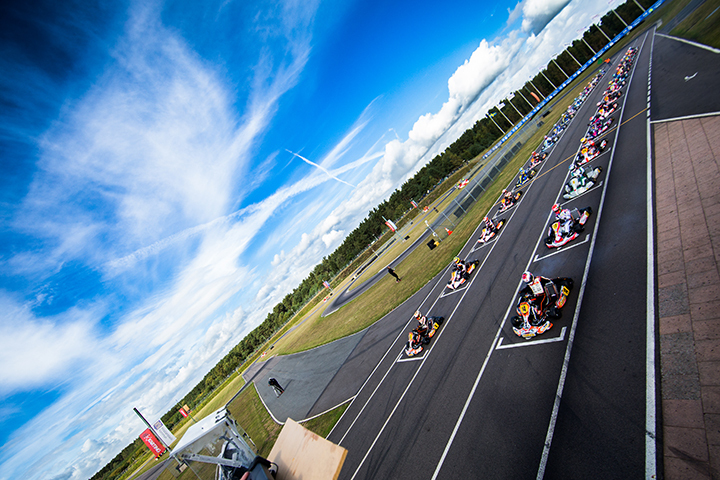 It’s here, you can breathe it: it’s the typical air of the CIK-FIA European championship! It will start on April 23rd at the Circuito Internazionale di Napoli in Sarno. Almost six months ago the last CIK-FIA event was underway: the CIK-FIA Asia-Pacific Championship held in Macao. Even if the CIK-FIA season has not started yet, drivers are racing since the WSK Champions Cup held in Adria in January, so we have enough information about their possibilities to win a title this year. The track near Naples will host the first appointment of the European season reserved to KZ, OK and OK Junior classes. Another international big event for the Italian facility that hosted the Rotax MAX Challenge Grand Finals the last October and it will host the last round of the WSK Super Master Series this weekend. In the new layout, the majority of Sarno’s iconic straights and corners are unchanged. The old configuration of 1,699 meters, was created and approved in 2006, but the new track now measures 1,590 meters. A significant change is in the last sector where one time there was the famous and terrible “triple s” corners that disappeared in the new design. The drivers will now turn left twice, then right, engaging and drawing something like a hook then in the traditional last corner before the starting grid straight. The CIK-FIA European Championship will move to Genk on May 14th with an event reserved to shifter classes and the young CIK-FIA Academy Trophy drivers. Slightly less than a month later the circus will move to the brand new Fernando Alonso Karting Circuit near Oviedo, Fernando’s hometown. July is the most demanding month for teams and drivers: they will be on track on July 2nd at Le Mans, then they will hit the track once again on July 23rd at Alaharma in Finland and the following week at Kristianstad in Sweden. Bridgestone has been selected for the exclusive supply of approved tyres for Categories III and IV; 2017 CIK-FIA KZ World and European Championships, 2017 CIK-FIA Karting Academy Trophy, 2017 KZ2 CIK-FIA European Championship and 2017 CIK-FIA KZ2 International Super Cup. With a lot of drivers stepped to upper classes, drivers at their second year in the category have a serious possibility to fight for the title. Andrea Rosso (Tony Kart-Vortex) is the strongest title pretender for the moment. He killed the competition in Adria and in Castelletto and conseguently he is leading the WSK Super Master Series. Baby Race’s driver was so close to win also the Winter Cup, but an accident took him out from the fight for the win. Not a huge problem for him since he took home the Trofeo Andrea Margutti one month later. This is the second year with in the Junior category and he demonstrated to have learn a lot the last year. Another Italian showed that he could be part of the game: Leonardo Marseglia (Zanardi-Parilla). After a year spent with Tony Kart with only a peak during the Deustche Kart Meistershaft in Kerpen, the driver from Puglia passed with Dino Chiesa and he took home a third place in Lonato during the Winter Cup and a win at La Conca in the WSK Super Master Series. He must be more consistent, but he can do well with Dino. Ricky Flynn Motorsport's duo Jack Doohan and Harry Thompson (FA Kart-Vortex) are two valid challengers for the Italians. Jack seems to be another driver compared to last year: he worked hard and he learnt a lot. Now he is constantly on top, but he is still missing a win this year. On the other hand Harry is third in the WSK Super Master Series and he won also the Winter Cup in Lonato. Last year he dominated in the UK and now he wants to dominate in the whole Europe. From Russia a driver will surely be protagonist in this European championship: Ilya Morozov (Tony Kart-Vortex). The Ward Racing driver started the season with a great win in Adria during the WSK Champions Cup, but since that moment he only took a third place the following week during the first round of the WSK Super Master Series. If the real Ilya drives, he could be part of the fight. The fight for the European title in the main direct drive class is so damn close and a lot of drivers can claim the title. The new CIK-FIA regulation allows 14 year-old drivers to race in the OK senior class and, despite they have less experience than other drivers such as Hiltbrand or Basz, newcomers demonstrated that they could be really really fast. Out of the 74 drivers, 52 of them are rookies and only 3 are wild cards. A new Rookie of the Year award will be presented to the driver that has scored the highest number of points, taking into consideration all results obtained during participation in the CIK-FIA World and European Championships (OK class) from 2017. Drivers must be in their first year of competition, and be no older than 16 years of age. Tony Kart field a four drivers squad in the fastest direct drive class. Pedro Hiltbrand (Tony Kart-Vortex) won his first race with Tony Kart in Adria. It seemed to be a beautiful fairy tale! After that race, Lady Luck gave him her back and he is still missing another podium place this season. Anyway he won almost everything last year and it didn’t happen by chance! His fellow countryman David Vidales (Tony Kart-Vortex) is growing fast and well: after the second place at the CIK-FIA World Junior Championship in Bahrain, he stepped into OK class and he did very well from the begin of the season. He didn’t finish the Winter Cup and the final of the WSK Super Master Series in Castelletto because of two accidents, but in the other races he took home two third place and a sixth place at his debut in OK during the WSK Champions Cup in Adria. Clement Novalak (Tony Kart-Vortex) in the last season he deserved something more, but in this first part of the season he is leading the WSK Super Master Series thanks to two victories in Castelletto and Muro Leccese. He showed that, with lady luck by his side, he can do very well! This year he has a serious possibility to take home the WSK title and he can do well also in the European championship. Gianluca Petecof (Tony Kart-Vortex) is struggling a little bit to be constantly on top, but he is a very talented drivers who is still growing. He doesn't be understimated. Dino Chiesa can count on two talented drivers in the fight for the European crown: Lorenzo Travisanutto (Zanardi - Parilla) passed under the Chiesa’s tend after a good World Championship in Bahrain and he immediately showed all his potential grabbing a second place behind Pedro Hiltbrand in the WSK Champions Cup and the win in Lonato during the Winter Cup. The reigning WSK Super Master Series champion started the series promoted by Luca De Donno with a second place in Adria, but in Castelletto and Muro Leccese he took home only a 10th place (due to a 10” penalty) and a DNF in the prefinal B at La Conca. The fight for the series is gone, but he is one a serious pretender for the continental title. On othe other side Tom Joyner (Zanardi - Parilla) doesn’t need introduction, but we can say that he tried the KZ2 and then he returned to OK from the second round of the WSK Super Master Series. He won, but he got a penalty because of a contact with David Vidales. The European championship will be a clean start for him. Alongside these two "big", there are other young and talented drivers and one of them is Adam Eteki (Zanardi-Parilla) who passed with Dino this year and with his new Italian menthor he is now able to fully express himself. The Kosmic Kart Racing Department has two drivers who arrived on podium places during the last World championship in Bahrain. The expert Karol Basz (Kosmic-Vortex) this year took home just a second place at La Conca, but he remains one of the fastest and most experienced drivers of the field, so he cannot be excluded from the fight for the title. His younger teammate Theo Pourchaire (Kosmic-Vortex), without the Junior World Champion Victor Martins, is the driver who have to keep the French flag high. In this first part of the season he wasn’t too consistent, but a third place in the Winter Cup and a fifth place at La Conca demonstrate that he could be one of the outsiders. CRG will mainly count on Hannes Janker, Callum Bradshaw, Flavio Camponeschi and Dennis Hauger (CRG-Parilla). The Norwegian driver this year is the first driver for CRG in the OK category, but his first part of the season wasn’t so satisfying: we saw the real Dennis only in Lonato during the Winter Cup, when he fought hard against Travisanutto for the lead. He need a fresh start from Sarno, but his talent can’t be understimated. Flavio passed from the shifter class to the direct drive class: a new challenge for the Roman driver, let's see how it goes. Ulysse De Pauw (Kosmic-Parilla) passed to the English team VDK and his debut in OK was during the WSK Champions Cup with a third place, followed by a win in the first round of the WSK Super Master Series. Then he took home an eight and a fourth position in the other rounds of the Super Master Series. Keep an eye on him. Another driver that should be kept under control is the reigning OK Junior European champion Finlay Kenneally (Tony Kart-Vortex) recently passed with Baby Race team. Last, but not least, is the Sodikart's wild card Alex Irlando (Sodikart-TM): after the fourth place in KZ2 last year, the young Italian from Puglia passed from Energy Corse to Sodi CPB Sport and he is learning a lot from his teammates Bas Lammers and Anthony Abbasse. Despite the union between KZ and KZ2 in this first part of the season, he demonstrated to be fast enough to fight against karting veterans. His performance are increased during this first part of the season: he started with a 13th place in Adria during the first round of the WSK Super Master Series and then he took an unlucky 18th place in Lonato during the 22nd Winter Cup, but in the other two rounds of the WSK Super Master Series he took home a 6th and a 5th place. Now he is ready for his second race in OK after a fifth place took during the Margutti trophy in Lonato. At the end of the third round of the WSK Super Master Series, Bas Lammers (Sodikart-TM) is leading the championship thanks to a win in Castelletto and two second place at La Conca and Adria. The 31 year-old driver seems to be the most consistent driver of the moment alongside his teammate Anthony Abbasse (Sodikart-TM). In Sarno the Dutchman took the world title in 2012 beating Ben Hanley, will the track sited near Naples bring him luck once again? From his side The 2016 Vice-World Champion demontrated also in this first part of the season that the Sodikart chassis is very reliable and very fast in every condition. He won the first round of the WSK Super Master Series in Adria taking home a fourth place in Castelletto and a seventh place at La Conca, being the runner up in the championship behind his teammate. Marco Ardigò (Tony Kart-Vortex), the reigning KZ European champion, didn’t have a great start this season. Anyway we’re talking about one of the fastest kart driver on the planet with a lot of experience. He surely will be part of the game and the third place took at La Conca is an encouraging signal. Even more encouraging is the win took by Patrik Hajek (Kosmic-Vortex) in Muro Leccese: last year he was one of the title contender in Genk, but Ardigò took home the title. He will divide the Kosmic's tend with another top driver who passed under Kosmic colours recently: Simo Puhakka (Kosmic-Vortex). Without Puhakka, CRG will field Mirko Torsellini and Paolo De Conto (CRG-TM). The reigning world champion started the season with the first round of the WSK Super Master Series in Adria and he suffered a problem during the prefinal, while in the final he was forced to retire due to a failure to the drive chain. Another accident in Castelletto took him out of the games and he didn’t race at La Conca because he had an accident on the snowboard a few days before the race. Not the best start of the season, but we know his value. Under CRG Holland's colours, we'll find on the grid the Pex brothers, Stan and Jorrit, both on TM powered CRGs. The youngest of the two Pex brothers started the season with a win in the WSK Champions Cup and he took a third in Castelletto during the second round of the WSK Super Master Series. Ups and downs for the Dutchman, but he has all what it takes to be one of the protagonists of the championship. Within the four wild cards in Sarno there are CRG's duo Alessandro Giardelli and Enrico Prosperi. The Italian driver is at his first year in the shifter class (he ws born in 2002) and he immediately grabbed the possibility to test himself against the greatest in order to learn as quickly as possible from those champions. Alongside Ardigò, Tony Kart will field as a wild card Matteo Viganò (Tony Kart-Vortex) the new official driver in the shifter class. That’s the chance he deserved after a good 2016 in which he finished 3rd the European championship, but he has to get the most of it. Since now he didn’t achieve any great result, but the season is long and he will have the possibility to show his potential to Roberto Robazzi and all the Tony Kart Racing Team. "This year is set to be a strong one for international karting. I am delighted with the success of the OK and OK-Junior categories and in particular at the CIK-FIA European Championships. With 74 Drivers involved in OK and 71 Drivers in OK-Junior, we are heading for an exciting season, especially as "Wild Cards" are going to add to the grids as well. It has been a long time since we have seen such a crowd. This is a very positive sign for the future of karting as a whole. Unfortunately, this is not the case for the CIK-FIA European KZ Championship. At one point we were concerned about a cancellation, due to a insufficient number of entries. It is needless to emphasise that I was not very happy with this. Thanks to the combined efforts of the CIK-FIA, the promoter WSK Promotion and some teams, we are able to announce that 21 Drivers registered for the entire Championship. It is important for manufacturers that KZ continues to exist. This is the area reserved for professional Drivers who actively contribute to the indispensable development of the equipment. We need to discuss the future of this cutting-edge category with all parties involved in order to find viable solutions together. Fortunately, the 2017 CIK-FIA European Championships will be able to take place in good conditions, which was our priority."